To prove his innocence. Not to the prosecutors, not to the cops. To his brother. But brother Hanford is halfway across the country and between Carson City, Nevada and Huntsville, Texas is a pile of trouble that Hal simply can’t seem to avoid. From stealing $20,000 to buy a DVD of a murder, to a low-rent casino in Vegas where a sadistic security guard is killed and a church filled with self-flagellant priests in Valentine, Texas, where a second shoot-out leaves a riot of bodies, Hal simply can’t catch a break. And during it all, Hal wavers. He wants to prove to his brother-the good brother-that he isn’t a killer. But as situations begin to pile up, Hal thinks less of his brother than his girlfriend and a safe, new life in Mexico. In a drive-in movie parking lot, he and his girlfriend and brother finally are forced to face both Hal’s haunting demons and the man who created the DVD of murder, and who wants his property back. It is a 2,000 mile journey that could lead to redemption and could just get him killed, and yet there is no way Hal Turnbull can avoid driving those miles. 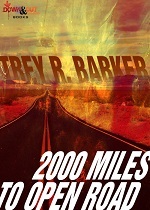 “A new voice in the crime fiction world, Trey R. Barker has made himself heard with this book. It’s kind of like Quentin Tarrantino on Methamphetamines. It’s not really a caper, but has some of those elements. It’s really just about a guy trying to get through an ordeal, and hopefully redeem himself a bit in the process. Barker writes with fury and the action in this book propels it at light speed. And yet the anchor here is the characters, human and flawed, but true.